KIEV, Ukraine -- The President of Ukraine has been accused of turning his citizens into 'slaves for the European Union' by a fuming Russian TV presenter. The TV host said the Ukrainian President was turning his citizens into slaves for the EU. Russian TV presenter mocked the Ukrainian President, Petro Poroshenko in an angry tirade in which he claimed Ukranian's were becoming slaves to the European Union. During his rant, the host targeted Ukraine's President suggesting his decision to join a visa waiver agreement is negatively impacting his citizens. 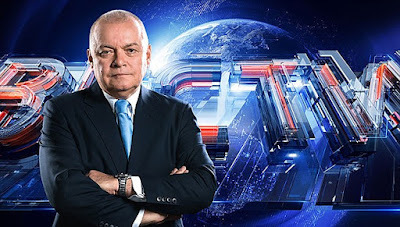 Speaking to Vesti News, Dmitry Kiselyov, said: “Previously [Mr Poroshenko] called a visa-free tourism to the EU a “national idea” of the Ukrainians. “Now, he said that a ‘final divorce’ was completed with Russia. “If you look at the price of this visa-free regime, there will be no giggles. He added: “According to official date of the Ministry of Foreign Affairs of Ukraine, four million of their citizens germanely reside in Russia. “Approximately the same amount of Ukrainian migrant workers reside in the West. “The visa-free regime that made Poroshenko giggle so much, turns his citizens into slaves for the European Union. The European Union approved visa-free travel for Ukrainians following a long-awaited decision. The host also criticised Ukraine for the way they managed the Eurovision song contest. “The European performance cost the Ukrainian treasury €30million, while better Eurovision music shows, for example, held in Sweden or Estonia, cost three times less,” he said. The TV presenter, who in 2013 was appointed by Vladimir Putin to head the country’s government-owned news agency, finished by claiming the EU was the most corrupt country in Europe. He said: “Following the results of the 2016, the Accounting Court of Auditors of the European Union, official recognised Ukraine as the most corrupt country in Europe. In February 2015, the warring parties to the Ukrainian conflict signed the Minsk agreement in order to bring an end to violence in the region. Earlier this month, Angela Merkel told Vladimir Putin that EU sanctions would be lifted if Moscow fully implemented the Minsk Agreement.